“Amelie’s Marriage Contract” A sweet western historical romance set in the 1890-1910 time frame. Amelie Gibson has seen her share of good and bad. Born to a wealthy gold miner and his less-than-humble wife, she knows firsthand what it means to have it all, then, watch it all be squandered away by her greedy mother. Logan Calhoun stands to inherit a fortune from his family estate, but first he must marry and prove he’s committed for the long-haul. With no marital prospects to choose from, he enters a one year contract marriage contract with Amelie, only to discover that it isn’t be as simple as he thought. Can they overcome the many hurdles in front of them and find common ground or are they doomed for failure? A sweet western historical romance set in the 1890-1910 time frame. Amelie Gibson has seen her share of good and bad. Born to a wealthy gold miner and his less-than-humble wife, she knows firsthand what it means to have it all, then, watch it all be squandered away by her greedy mother. Logan Calhoun stands to inherit a fortune from his family estate, but first he must marry and prove he’s committed for the long-haul. With no marital prospects to choose from, he enters a one year contract marriage contract with Amelie, only to discover that it isn’t be as simple as he thought. Can they overcome the many hurdles in front of them and find common ground or are they doomed for failure? 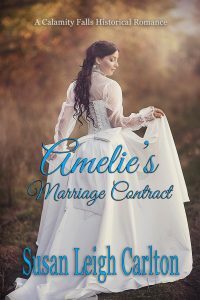 “Amelie’s Marriage Contract” is the second book in the Calamity Falls Historical Romance Series. Many of the characters from “Abby’s Love” are also in this book. Purchase “Amelie’s Marriage Contract” by clicking here.